I was fortunate to see Seve – The Movie, the other day. If you are a golfer this is must see! The story is about Severiano Ballesteros the dashing, go for broke Professional Golfer that took the world by storm. Before I talk about the movie, I would like to give you some background on Seve. Seve turned professional in 1974, at the age of 16, and two years later he finished second in the Open Championship. During the next 21 years he amassed 91 victories worldwide and 5 MajorChampionships. He was inducted into the World Golf Hall of Fame 1999. After being diagnosed with brain cancer, Seve underwent several operations and outpatient treatments. On May 7, 2011 Seve dies after a serious deterioration of his condition. The movie starts out showing video of Seve in his playing days then cuts back to a young Seve played by José Luis Gutierrez. From an early age Seve had one goal, that was to win Championships! His single-minded focus drove him to continually practice down on the beach not far from the family farm. His first club was a 3 iron and he used it for every shot, learning to hit all types of shots with this club. One of the biggest reason he had such great imagination and touch. His short game was legendary and many of todays teaching professionals use his techniques in their own teaching. His brothers got him a caddie job at the local club but he wasn’t allowed to play at the club except for the caddie tournament. While caddying, he met a Dr. – who was a member – and caddied for him frequently. The Dr. was a huge fan of the young Seve and asked him to play a match as his partner against some other members. Needless to say, Seve and the Dr. won the match! Then a gauntlet was thrown down. Seve against the 25 year old club champion. The bet was $50,000, the equivalent of around $3500.00 US dollars. His father sold his two calves while his brothers rounded up the rest of money fro friends and townspeople. I am not going to tell you the outcome of this match, you will need to go to the movie to find out! While he was virtually blocked at every turn, he fought long and hard to become one of golf’s best players ever. The movie does a very good job of interweaving the young Seve with video clips of the professional golfer. There is a scene toward the end of this movie that might bring a tear to your eye, it did me. I would recommend that ANY golfer go see this movie, especially all of the Junior Golfers out there. Set your mind and focus into what you want to achieve. Believe, train it, trust it! Who wants to put on everything they own just to play golf…not ME!!! Yet, people do actually play in this cold because they are golf junkies! Why not come to the desert and play in SUNNY, WARM weather…and wear shorts if you want! And while you’re here, give me a shout and we’ll get your game in shape before you head back to that frozen tundra! As some of you, I received a VIP pass to the Feherty Off Tour show here in Phoenix last night, and the place was packed! I only saw 2 empty seats in the theater. The backstage party started at 6pm and went until 7pm, the show started at 7:30 and went a full 2 hours…non-stop! Some of you may not be a fan of David but I have to tell you, he is extremely funny and humble! The night was filled with stories from his days on the Tour, his family, caddies and fellow tour players. He had great stories about Ernie Els, Tiger, Colin Montgomery, Sir Nick Faldo and many more. The player stories were not only insightful, but hilarious too! Was there any “off color” language…you betcha…but all in jest! David is very open about his addictions with alcohol, drugs and depression. In our before show chat, we briefly shared those experiences and how they changed our lives. My good friend Rayl Evans, was there as well and afterward he told my it may been the best “comedy” show he had ever attended! Several local pros showed up including Martin Chuck and a golf “rocker,” Alice Cooper! I tried to get Vince/Alice to slow down and ask him if remembered the set of golf clubs I gave him at the Beverly Hills Hilton several years ago, but he was gone in a flash! I mentioned that some of you may not be fans of David. If you are in that group, you owe it to yourself to go see his show…then decide for yourself! When I sent out an email to our clients (over 1.2m) about the show, I had ONE person write me back and say that he found David “distasteful” and he un-subscribed from our list…fare well…don’t let the door hit you in the a$$! We had a great time and I look forward to going again some day! Boy this year sure went by fast! The Holidays are already here and like a lot of folks, I haven’t even started getting ready. We ate our body weight in turkey and all of the “fixins” along with 3 different pies…now it’s football all day…what a life! This is also the time of year to reflect on what has happened this past year and what to look forward to in the upcoming year. We have a lot of be thankful for: The success of our players this year, meeting new friends that influence our lives, being with family and most of all thankful to the Lord for watching over us and guiding our every move! We will experience some changes in 2016, but I’ll write more about those next month. Health issues will determine our decisions for 2016 but no matter what, there is nothing like being around family and friends! Have a great Thanksgiving and don’t start that diet until 2016! You remember Doc Brown’s futuristic car from back to the future. Well today is back to the future day! A lot of us started out as kids playing this silly game. Hit a ball, hit it again, hit it several times then putt it in the hole…simple huh! When we were kids we had NO fear of putting. We would run a putt by 4,5 and even 6 feet past the hole then make it coming back. Why? We didn’t know these were supposed to be tough! In later years, we hit these same putts but now we are nervous about them. But don’t feel like you are along! The great Tom Watson went through the same thing. In his early days on Tour if he missed the putt he would have these knee-knocking come backs, BUT he made many more of these then he missed. Well, time caught up with Tom and he went through a spell when he missed a lot of those come backs. So start today with a “back to the future” attitude…have no fear of missing a putt and be confident, that if you do, you will make the one coming back! We train our players with this attitude and they ARE making more putts…YOU can to! We all pretty much thought this would be the case until Jason Day had an out-of-world 2 months! When Sports Illustrated sent out an email asking me, as well as others, who I thought Player of the Year should be, I answered…it depends. If Jason won the FedEx Cup then I would vote for him. If Jordan won then he gets the vote. Well, as we all know, Jordan won The FedEx Cup, along with $10 MILLION MORE dollars! 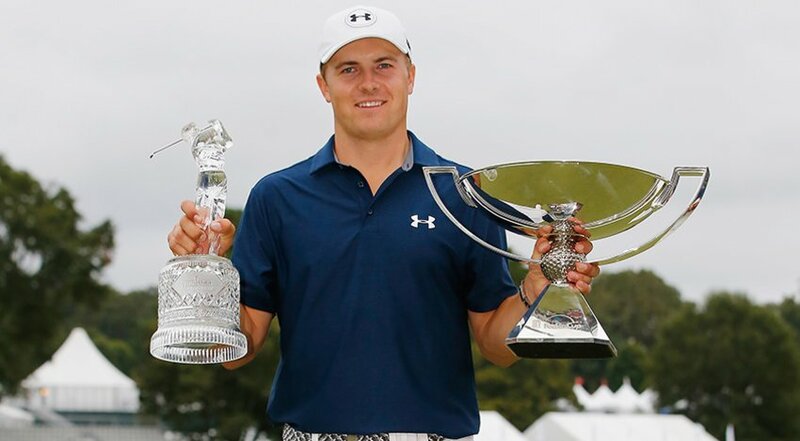 The PGA TOUR announced Friday Jordan Spieth as the PGA TOUR Player of the Year and Jack Nicklaus Award recipient, and Daniel Berger as PGA TOUR Rookie of the Year, as voted by the TOUR’s membership for the 2014-15 season. PGA TOUR members who played in at least 15 official money events this past season were eligible to vote. The balloting process ended on October 1. Congratulations to Jordan and Daniel on receiving their honors! I can remember the day vividly. I was on the road conducting golf clinics in Bristol TN. It started as just another day doing what I love to do, conducting golf clinics. In those days I traveled an average of 135 days a year, in a different city every day helping golfers around the US to improve their games. During a 2 year period we saw 200K golfers, had a crew of 6 and held these clinics in hotels. We were at the Hilton in Bristol and the room was packed, we had over 250 golfers that day in attendance. These clinics ran for 3 hours, myself and a club manufactor rep shared time on stage. Typically, I would present swing ideas and then ask for a volunteer to join me on stage. I would ask them how long they had been playing, what their handicap was, the shot(s) that gave them the most trouble, and what they would like to improve. After having them warm up, by hitting balls into a net, I would start the process of helping them. We have a very large screen on stage so that everyone in the audience could see what we were doing. In addition, we were running a video camera and could play back the swings. After a few swings, and making the necessary changes, we would run the tape side-by-side so that everyone could see the before and after of the person on stage. That day, after I had finished with the player, I took a break while the club rep took the stage. As I walked out into the lobby I immedately noticed large crowds gathered around the multiple TV’s and several people were anxiously on their phones. I walked over to one of the TV’s and as I looked up I saw the second plane crash into the tower. I stood there in shock not knowing what to do. People were trying to get back to their families but all flights had been canceled. Those lucky enough to have rental cars were making their way back home. We had a room full of people that did not know what had just happened. I went back into the room, made my way to the stage, and calmly told everyone what had just happened and suggested they make their way home. Fortunately, the majority of the attendees were locals. We were scheduled to travel from Bristol to Knoxville then Nashville and finally Memphis on this trip. We couldn’t get a flight out either so the only thing to do was to go to our scheduled cities. I called the office and asked if they had seen the news, they had, and then asked if the other cities has been canceled, they said no. No one has called to cancel their attendance. As we proceeded to do our clinics golfers still showed up but the mood was somber. In Nashville, I went down to the business center to send out emails before we left for Memphis and call friends up in NY so check on them. As I was sitting at the computer I glanced down at the waste basket and saw a binder filled with pages. I picked it up to see what it was and it was a flight manual! I immediately called hotel security and they called the FBI. When they arrived I was questioned and asked if I had seen anyone at the computer prior to me using it. I answered no. They then did a search on the computer trying to find a link to the flight manual and tracked down 2 people that had used it before me. They had gotten on a shuttle to the airport and as they were getting out one of the men handed the shuttle driver a knife explaining that he had forgotten he had it. Evidently they didn’t know that all flights had been canceled. The FBI tracked them down but I don’t know what happened after that. Once I got outside, with the crew, everyone from the hotel was standing in front of the building. I noticed that the entire front of the building was glass and to the north of the hotel was another building, a parking garage with no glass. I suggested that everyone move to the parking garage and away from the glass. No one moved so I took our road crew over for shelter, just in case. After the bomb squad checked the building and found nothing we were allowed to go back in. After we finished our clinic we checked to see if we could a flight out but the planes were still grounded. I called DFW, Dallas Ft. Worth, and they said we could get from there so we saddled up and headed to Dallas. Once we arrived we turned in our rental cars and checked into the hotel hoping to get out the next day. We were stuck at the hotel for another 3 days and until finally flights were allowed. Our crew was mostly based out west, Oregon and California, but we did have 2 people based in Florida. Had we known we couldn’t get out we would not have turned our rental cars in! I think about 9/11 every year at this time and am saddened by the loss of life. The civilians, firefighters, police. If you are like most players you have a fear of sand bunkers, and rightfully so! Greenside bunkers are designed as a stroke and half penalty and it is up to us to either make it less…or more! Bunker shots are really more technique than anything else and without it, welcome to skull city. As I have looked at some of the world’s best bunker players, and teachers, they all have a common theme. Setup with your body lines left, if you are a right-handed player, aim the clubface at the target and then swing along your body line. Sounds simple enough. But wait…there’s more! After a good setup, there is another piece…a long backswing and an aggressive through the swing. Take a look at this setup and then we’ll go into more detail. …feet, knees, hips, and shoulders. The swing path is where the clubhead moves back and down and the target is where you aim the clubface. Dave Stockton, Gary Player, Ernie Els, Seve ALL use this setup. There are others that you can use but I would suggest starting with this one and if you are having issues then contact us for more in-depth coaching. Once you have your lines set up then place a little more weight on the target side foot. As you swing back, keep the weight forward and the knees bent. In the downswing, use the upper body and hands primarily while maintaining a steady foundation of the lower body. The weight should already be forward and there is no need to add any more. In greenside bunker play, we want to use the “bounce” of the club so that it will glide through the sand. If the player uses the leading edge the wedge will dig too much and those usually end up staying in the bunker. The majority of players I see use too short of a backswing and rely on speeding up the club in the downswing. While we certainly want acceleration through the ball, we would suggest making a normal length backswing to do so. To learn more about improving your game schedule your time with us. Bob was a struggling, wannabe, amateur tournament player and had tried all of the “fixes” to help his game. As he went from one thing to another, a new found swing “fix” or the latest fad in golf, his tournament scores got worse! Desperate to find the “secret,” to get him to his goal of winning tournaments, he spent time with every teaching pro he could find. He tried numerous training aids, mental game gurus, different golf clubs but nothing he tried seemed to help. You see, Bob, hit it absolutely pure on the driving range but once he got on the course his game went to heck! Sounds like a lot of us doesn’t it. Great on the range, not so much on the course. Bob asked the old pro if he would take a look and give him some thoughts. When they got to the short game area the old pro threw some balls on the ground, in different types of lies, and asked Bob to hit the balls toward various targets on the green. As Bob hit each shot they all finished close to the hole, a couple of them actually went in. The old pro never said a word. They then moved to the putting green and balls were placed all over the green and Bob was asked to putt them out, again at various holes. Some were downhill, some uphill, some left to right, and some right to left. Bob thought about what the old pro had just said and realized, he was right! Bob, always got nervous when playing in tournaments. He always tried shots that had small success ratios, he virtually never played to his strengths. He rarely thought about managing his game on the course, he took things for granted, he was thinking about his playing partners game, or thinking about this swing instead of focusing on the outcome…getting the ball in the hole! Other players in the field who always beat him with what he thought was inferior ball striking, but yet they always got it in the hole and he did not. Bob took a month off from tournaments after hearing the “old sage” advice and decided to try and get “out of his own way.” He played a lot of golf and only hit balls to warm up before he played. Once on the course he didn’t think swing mechanics but instead focused on getting the ball in the hole. As he was on the range loosening up before the round he felt something he had never felt before, his mind was calm. No thoughts of swing mechanics, a peaceful, uncluttered mind, and for the first time ever…no sense of defeat! Bob didn’t win this tournament, a couple of loose shots cost him a few strokes, but he learned something even more valuable than the win. He hung in there, didn’t lose his composure, played golf instead of playing golf swing and found that he had more fun playing golf then he had in a very long time while being competitive under tournament conditions. It was by far the best showing he had ever had in a tournament and this was just the start. He knew that if kept reminding himself, of what the old pro had said, that he would eventually reach his golf…win a tournament! If you would like to learn how to get out of your own way, schedule your time with us. As coaches we see the same issues with players day in and day out. These are very simple mistakes that any player can self correct, all you have to do is…well…just do it! Let’s start with some of the very basic mistakes. 1. Hitting driver on every par 4 or par 5. In reality, the player needs to hit the club that will put them at around the 150 yard marker. If you look at overhead views of golf holes, a lot of them show the fairway narrows the farther down the fairway you go. Or the trouble is reachable with a driver. The smarter play would be to hit something short of the trouble. That might be a 3 wood, hybrid or even an iron. Lots of players tell us they hit their 3 wood better then their driver! 2. Aim for the middle of green. Don’t go “flag hunting” unless you have complete control of golf swing! If you are someone that fades the ball then left hand pins are in the NO GO category. The same can be said for those that hit a draw – right hand pins, NO GO! 3. Take enough club. Again, a lot of golfers THINK they know how far they hit each club but yet when doing a “find your distance” session we find that they are NOWHERE near the yardage they think they are. Quick story about knowing your distance. Now there are a number of others issues that we, as players, can look at and make adjustments but these 3 will get you started. Have you ever wondered how players find a golf instructor or how YOU should choose one? In this webinar we talk about a few of the things that everyone SHOULD ask, and know, before choosing the right one. Choosing the right instructor for you helps determine whether or not you have success in reaching your goals. If you are starting the ball in a different direction with every swing then how can you aim? Two-way misses don’t give us very much consistency. But once you have a consistent start line then you can work on the amount of curve. The start line, where the golf ball is starting its flight, is controlled primarily by where the clubface is pointing at Impact. So if you want the ball to start right then you had better have the clubface pointed right at Impact. But a club face pointed right, or left, won’t get the ball back to target…it needs a little help from the club head path. If the face/path relationship is square to each other then the shot would be straight. It could be straight at the target, straight to the left of target, or straight to the right of target depending on the start line. A point to remember is that if the ball is curving it is always away from the path. So for right-handers, this means that if the ball is drawing – right to left – then the path is farther to the right of the clubface. If the ball is fading – left to right – then the path is farther to the left of the clubface. A lot of players get confused however when talking about club head path. Their “vision” of it is that the clubhead needs to be moving in whatever direction coming into the ball. Actually, and the reality is, the path of the club head from Impact forward. The past couple of days I have had players focus on start lines by placing an alignment stick, vertically, in the ground directly between their golf ball and their target. From a square stance, I then ask them to start the ball either right or left of the alignment stick. We don’t talk about swing mechanics when using this exercise but to simply focus on what the hands need to do to effect the club face for the shot I call out. Once they are controlling the ball start line I will then tell them to make the same swing but I won’t tell them where to start the ball until they have started their downswing! Now, this gets their attention! Just today I had a player that kept telling me he didn’t know where his hands were or what they needed to do. After doing the above exercise, and successfully hitting his start lines, a big smile came across both of our faces. If you don’t know what YOUR hands are doing then try this exercise and I guarantee you will soon!Until next time, keep it in the short grass! To get more great content like this join our newsletter! A LOT of players want to draw the golf ball but most never do! The KEY is to adjust your set up like this image. 3. Swing along your body line, in this case where you want your clubhead to travel, while keeping the clubface closed to the path. I had written this article a few years back, but thought with all of the “arm chair” golf instructors talking about what Jordan and Cameron “should” be thinking about today, in the final round of the Masters, it would be a nice time to revisit. We’ve all, at some point in our golf careers, had a match or a tournament that we’ve either won or really wanted to win. What separates winning from finishing behind the winner? Here are several things that players need to do to put themselves in a position to win whether you are a low and or high handicapper, there are commonalities to look for. First, you must play within yourself. This means that you don’t attempt any shots that you have not practiced many times beforehand. If you are a fader of the golf ball and the shot calls for a draw then don’t try to hit this shot. Play to your strength and not your weakness. Secondly, play the golf course and not your opponent. It’s the last round of the tournament, and you are leading. Keep doing what you have been doing to get in this spot! Feeling the need to throttle back, or “protect” will only produce anxiety…and that can be dangerous! This is where many players get caught up in the moment. They try to keep up with their opponent in driving distance, hitting clubs that they cannot get to the green, trying shot shapes that don’t fit their stroke pattern and a host of others things. Thirdly you must prepare for the event. This means charting the course and the greens even if you have played the course many times before. Develop a strategy for how you are going to play the course and pick the holes that you can attack and the ones you will need to be a little more conservative on. If you are an aggressive type of personality then you must attack, attack, attack! But pick your spots to be aggressive! Winners see things happening in a positive manner. Players that don’t win see negative images instead. Players also need to check their equipment. Are your loft and lie angles correct for you? Have your wedges been knocked weak? If you play a lot of golf or practice a lot you need to have these checked on a regular basis. PGA Tour players have theirs checked every week and adjust them based on course conditions or the shot shape and trajectory they will need for that particular course. Some other things you will need are plenty of golf balls, tees, a marker to mark your golf ball, new golf gloves – if you wear them – clean grooves on your irons, an up-to-date rule book and making sure before you reach the first tee that you have counted your clubs to make sure that you have no more than 14. Ask Ian Woosnam about this one! Here is a little poll to see what you all think about Tiger and the 2015 Masters. In this weeks webinar, we discuss the importance of club fitting. Having a properly fitted club is mostly overlooked by golfers of higher handicaps. ALL of the best college and professional players have their clubs FIT to them!